Initially formed by members of Moon Ska Records recording artists Easy Big Fella, Natalie Wouldn't entered the Seattle music scene in 2000. The original trio of singer-songwriters built on the initial model, added some instrumentation, went through a few changes and finally evolved into a tasty five piece musical organization creating and performing an original blend of ska, soul and rock & roll. The current line-up of Natalie Wouldn't - [ vocalist and guitarist, Rick Dybvad (formerly with Easy Big Fella), saxophonist and vocalist, Shawn Brockman (formerly with Easy Big Fella, The Crawdaddies), bassist Kevin Crosby (Squirrels Alumni Member, formerly with The Crawdaddies), and drummer Mike Fanning (formerly with Easy Big Fella, The Crawdaddies), Trumpet and vocal/Rick Penttila (formerly with Easy Big Fella, The Diablatones), Sax, Vocals/ Sean Jensen (formerly The diablatones) ] are a skillful and talented group of performers dedicated to writing and playing fun, high quality music. The band's top performance skills and sharp material caught more a few ears and soon Natalie Wouldn't was working in and around the Pacific Northwest area, headlining shows and warming up for well established international bands such as The English Beat, The Toasters, Bad Manners and The Phenomenauts . Natalie Wouldn't also plays frequently at many music festivals including the Seattle Folklife Festival, Seattle Ska Fest, and the Victoria Ska Festival. In the summer of 2007, Natalie Wouldn't expanded their territory and traveled to England for a short tour of London, Reading and Brighton. Early in 2008 - at the invitation of Megalith recording artists, The Toasters - the band flew to Hollywood, California to perform at the famous '3 Floors of Ska' Festival at the historic Knitting Factory. The summer of 2008 is rapidly filling up with show after show at various music festivals and clubs in and around the Pacific Northwest. Tentative plans are in the works for a short tour of Brazil. 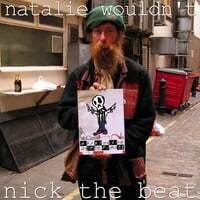 The Second Natalie Wouldn't CD, 'Nick the Beat' was released in 2009. The 12 song CD is very up beat and very true to the SKA that Natalie Wouldn't is know for doing. The mix of songs on 'Nick the Beat' are crafty, memorable tunes that reflect the kind of true collaboration that happens when a band develops a sound live in rehearsal and on the stage. Natalie Wouldn't is distributing their material at www.cdbaby.com and will also make their songs available for download on the web via the iTunes website in addition to the traditional merchandising at shows. Natalie Wouldn't is currently performing and distilling the new material destined for the studio in addition to their already established favorites. Please visit www.nataliewouldnt.com or www.myspace.com/nataliewouldnt for more information, reviews, show schedules, photos and free downloads.